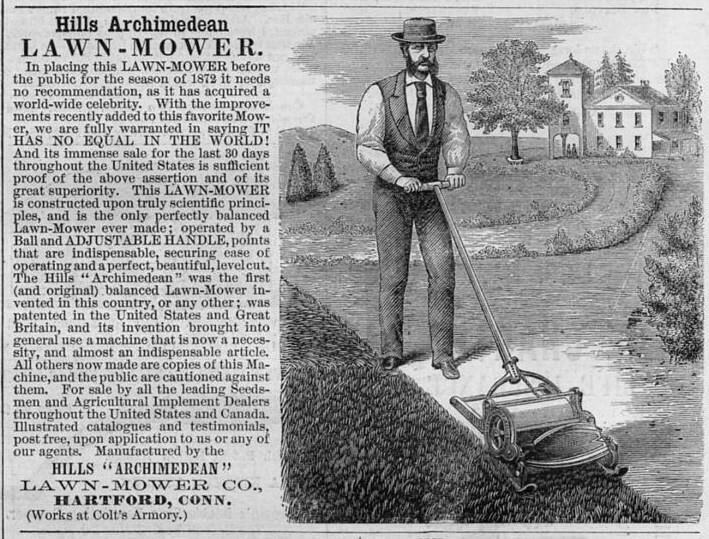 On January 28, 1868, Amariah Hills of Hockanum, Connecticut, received the first US patent for a reel-type lawn mower. In 1830, Edwin Beard Budding, an engineer from Gloucestershire, England, had received the first patent for a reel-type mower, a machine with a blade assembly that rotated around a horizontal axis. Also known as a cylinder mower, this type of grass-cutting machine had two large cast-iron rollers that, when pushed across the lawn, provided traction to an oversized gear that then rotated the spiral cutting device against a stationary cutting bar. Corrigan, David J. “Amariah M. Hills: Connecticut’s Lawn Mower Man.” The CONNector, November 2000. Link. Hills, Amariah M. Patent Number 73,807 - Lawn Mower. 73,807. Hockanum, CT, issued January 28, 1868. Link.